Students on the campus of UMass Amherst. The Pioneer Institute is set to issue a report on Thursday highly critical of the University of Massachusetts for admitting too many out-of state students — a charge that prompted a sharp preemptive retort Wednesday from the university, which accused the conservative-leaning think tank of favoring private colleges over public ones. The report, based on Pioneer research, warns that the UMass system has increased academic selectivity and focused on recruiting outside Massachusetts, thereby making it an unattainable option for many local students. For the first time, UMass Amherst in 2015 accepted more non-Massachusetts residents than residents — although by just six students. UMass officials, who reviewed the study before its release, fiercely contest the findings. A UMass Amherst spokesman issued a six-page rebuttal of the report’s assertions, and UMass president Martin T. Meehan, in an unusually strong statement, called the report an attempt to protect private schools. “This report was essentially ‘written’ before the study was launched, and it is equally clear that Pioneer has an agenda of protecting those Massachusetts private institutions that haven’t been able to keep up with UMass in terms of enrollment, rankings, and stature,” Meehan said. UMass officials also pointed out that Jim Peyser, the education secretary under Governor Charlie Baker and an ex-officio member of the UMass board, is a former director of the Pioneer Institute, and said the think tank, and Peyser, lack support for public colleges and consider them inferior to the host of private schools in the area. The study was issued two days after the state Senate, whose president hails from the Amherst district, unveiled a state budget that would increase funds to UMass. It also comes weeks before a June meeting in which UMass trustees may vote to increase tuition. A spokeswoman for Peyser said Wednesday that the secretary looks forward to reviewing the report. “The Baker-Polito administration is focused on ensuring that our students receive the best possible quality and value out of our public higher education system,” the spokeswoman said. The report, a three-part analysis, also explores the UMass building boom, saying the university has expanded so rapidly that it has dangerously increased its debt while ignoring overdue maintenance. Sullivan, who co-authored the studies with Matt Blackbourn, said it was performed because Pioneer supports public higher education and wants it to improve. He said he hopes the research will prompt lawmakers to curtail the scope of UMass’ expansion, insist it address deferred maintenance, and prompt UMass to cap the number of out-of-state students. UMass has increased enrollment by 27 percent in the past decade, a rate faster than the national average for public universities and for private colleges in the area, the study found. The study questions how growing enrollment of the five-campus system and increasing selectivity will affect small, private colleges in the state, and to what degree UMass has an obligation to educate Massachusetts residents, since it receives state money. “The UMass expansion and their planned expansion of enrollment has a crowding-out effect and adversely affects some of the private colleges,” Sullivan said. UMass officials said 80 percent of its graduates remain in Massachusetts in the short- to mid-term, and said 65 percent stay long-term, whereas most private school students leave the state when they graduate. 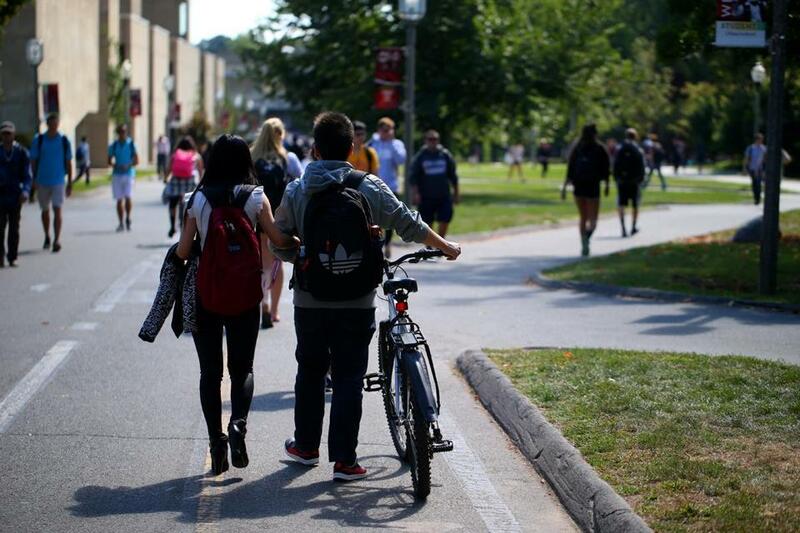 The study found that the number of out-of-state students across the UMass system increased 85 percent since 2008, while in-state enrollment increased 19 percent. Currently, 23 percent of UMass undergraduates come from other states or countries, a percentage lower than the five other state flagship universities in New England, except the University of Connecticut. At the University of Vermont, out-of-state students account for 71 percent of students. UMass in recent years has pressed the Legislature for more money, waging a battle with lawmakers last year over $10.9 million UMass said it was promised but never materialized. The increasing reliance on out-of-state and international students, who pay higher tuition, reflects a national trend at many state universities. Some schools, including the University of North Carolina Chapel Hill and the University of California Berkeley, have imposed caps on out-of-state students, the study said. Tuition and fees next year at UMass Amherst will be $14,600 for in-state students, and $31,400 for out-of-state students, according to the school website. The report suggests that if UMass plans to rely so heavily on out-of-state tuition and fees to offset expenses, it should consider raising the rate for those students. The University of Vermont, for example, charges 28 percent more for out-of-staters than UMass, the study said. One part of the study focuses entirely on UMass’ building boom and subsequent debt, which rose from $946 million to $2.9 billion in the past decade, with annual debt payments that now total $223 million, the study found. UMass invested $3.8 billion in new buildings and facilities in the past decade, and plans to spend $7 billion more before 2019, the study found. Meanwhile, UMass has not adequately maintained its existing facilities, the study said, and the backlog of unattended maintenance grew to $3.3 billion in the past decade. The study likened this trend to what has happened at the Massachusetts Bay Transportation Authority, another state entity riddled with debt and needed repairs. UMass trustee Margaret Xifaras pointed to the remodeled UMass Dartmouth library, which saw an uptick in usage afterward, as an example of why new projects matter. “If we just chase the maintenance alone, we would just be sort of stuck putting Band-Aids on,” she said.